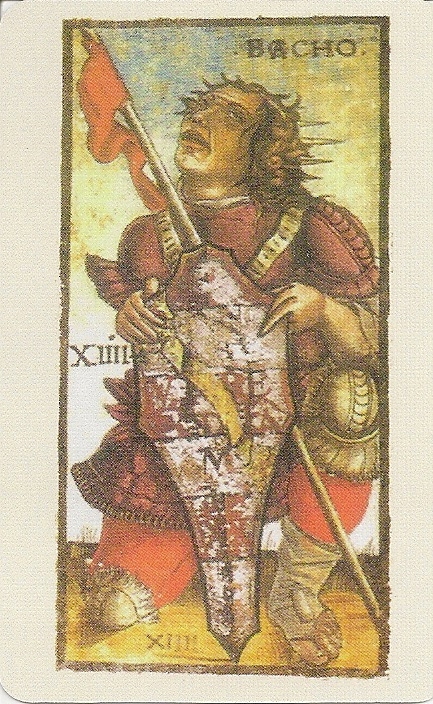 The Sola-Busca Tarocchi may be dated from around 1490 since the hypothetical date of 1491 was painted on one of the illuminated cards of the set (the inscription "ANNO AB URBE CONDITA MLXX" on card XIIII may be read as the date of 1,070 years after the foundation of Venice - either 421 or 453 - that should mean 1491 or, less likely, 1523). Giordano Berti and Michael Dummett suggest that the deck might have been engraved in Ferrara and illuminated in Venice (or for the Venetian market). The art was bulino engravings printed on paper pressed and glued as cardboard, illuminated with colours and gold, painted faux porphyry on the back. 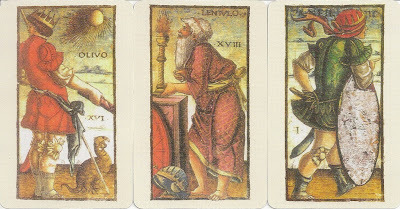 Today the painter Nicola di Maestro Antonio from Ancona is identified as the artist of the deck, and the Humanist and Hermeticist Ludovico Lazzarelli is believed to have designed the complex iconographical programme of the Sola Busca Tarot. 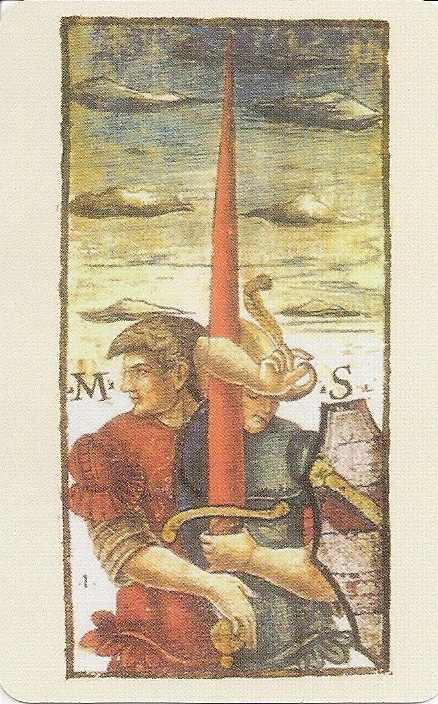 The coat of arms featured in the deck, which have been identified as those of the two Venetian noble families Venier (red and white coat of arms/ Bochos shield) and Sanudo (coat of arms silver with blue ribbon/Aces of coins and cups), and the presence of the monogram "M.S." on three of the Aces suggest that the owner of the deck, and the person responsible for its colouring in Venice in 1491, was Marin Sanudo the Younger, the famous Venetian Humanist with an interest in alchemy . The complete deck, which was owned by the Sola Busca family, was photographed in 1907 for the British Museum. In 2010, the Pinacoteca di Brera museum in Milan bought the deck for 800.000 EUR. The Figures on the Trumps represent historical / mythical characters. The characters are identified by names printed on the cards: Mato, Panfilio, Postumio, Lenpio, Mario, Catulo, Sesto, Deo Tauro, Nerone, Falco, Venturio, Tulio, Carbone, Catone, Bocho, Metelo, Olivo, Ipeo, Lentulo, Sabino, Nenbroto, Nabuchodenasor. But whatever name was given to the Trumps, in order to be actually "used" they still had to include traditional meanings. These could be identified on the basis of the iconography and history of the figures depicted. Bocchus, for instance, who had betrayed his ally Juguretha embodies the figure of The Traitor (The Hanged Man), wheras Cato, who took his own life, embodies Death. 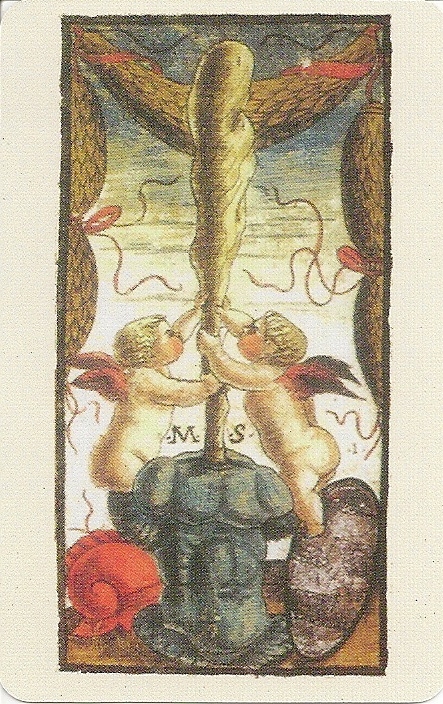 The Sola Busca is the earliest known deck to have illustrated Minors. 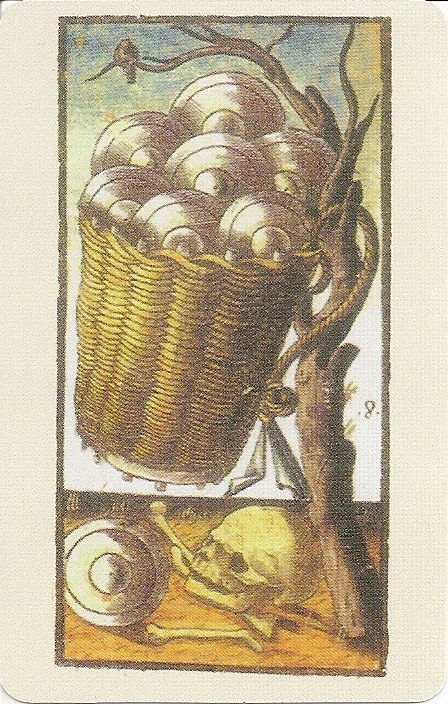 Shortly after receipt of the black-and-white photographic images of the Sola-Busca Tarot, they were placed on exhibit at the British Museum in London. 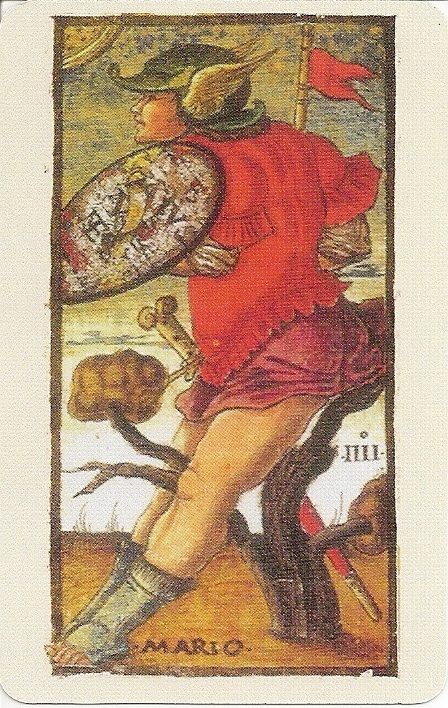 It is probable that the experience of viewing of this exhibit provided the initial stimulus for Arthur Edward Waite and Pamela Colman Smith to subsequently create their own tarot deck with all 78 cards illustrated. A comparision between the Sola Busca and RWS Minors can be found here. 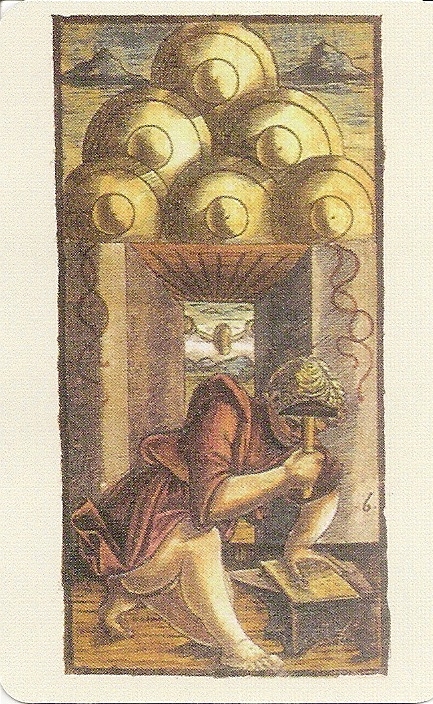 In the suit of coins several cards show practices such as assaying, hammering and the checking of flan sizes which can be either related to minting or to the alchemical work. 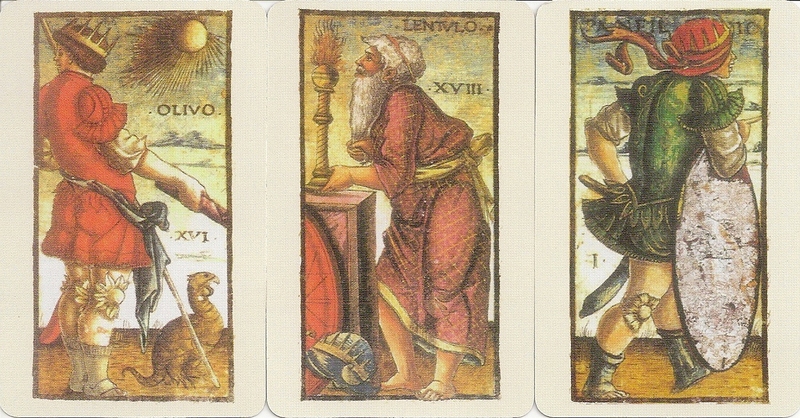 The alchemical iconography is particularly evident in the 4 of Coins (Earth as mother of the metals), the 5 of Coins (the male element as the alchemist who impregnates the earth to get the philosopher's stone, with the use of fire) and the 9 of Coins (“nigredo”, blackness as the death of the first matter, the first step of the alchemical process). The suit of batons also features alchemical motifs, offering a parallel between alchemy and agriculture, of the sort drawn in the treatises by Pseudo-Llull. Several reprints of the Sola Busca Taro existst: Lo Scarabeo, Italy 1995; Wolfgang Meyer edition, Germany 1998 and HistoricalRetrospective edition, USA 2012. Mine is from the first Historical Retrospective edition with bridge-sized cards.